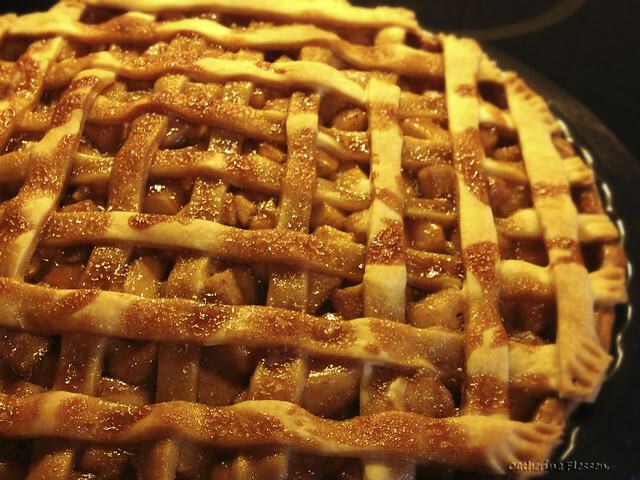 Apple pie with lattice top crust | SMØRGÅSBORD! Preheat oven to 220°C. Line the bottom of a pie tin with parchment paper, then place one of the pie crusts. Bake blind for about 10-12 minutes. Set aside. Melt the butter in a saucepan. Stir in the flour to form a paste. Add the water and sugars, then bring to a boil. Reduce the temperature then let the caramel mixture simmer for 5 minutes. Set aside to cool slightly. Place the apples in the pre-baked pie crust, forming a slight mound at the center. Cover with the top crust, arranged to form a lattice pattern. Pour the caramel mixture carefully over the top. Reduce oven temperature to 175°C then bake the pie in it for about 35-45 minutes, or until the apples are soft and the top crust is golden brown.